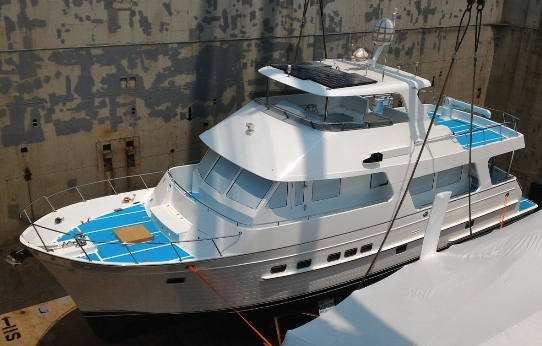 The Outer Reef Team is excited to present the first hull for the new 610 Classic Motoryacht. Standing in between the 580 and 630 models the new Outer Reef 610 Motoryacht has been deemed the ‘perfect-sized’ yacht for owner-operators who are looking for ease of maneuverability, fuel efficiency, storage capacity, and incredible interior volume. Interior accommodation space allowing for a full beam master cabin with a central king berth, large L-shaped walk-in closet and abundant cabinetry and storage. The open main deck layout provides nearly unlimited sight lines from her pilothouse, an adjoining galley with full size appliances and large pantries, and a comfortable salon with covered aft deck for alfresco dining. The added length of the hull under the extended swim platform will increase hull speed, raising efficiency and top-end speed.